HealthMate Plus Filter FR450. The HealthMate Plus filter utilizes 60 square feet of certified true HEPA media is used to remove 99.97% of all particles down to 0.3 microns and 95% down to 0.1 microns. The HEPA is surrounded by 15-lbs. of an impregnated carbon/zeolite mixture to absorb odors, smoke, VOC’s, benzene and formaldehyde. The impregnated mixture has also been treated with the mineral, potassium iodide, aiding in the absorption of VOC’s. Because the activated carbon is porous, it increased the surface area available for absorption. Zeolite is a microporous mineral that aids in the absorption of some compounds better than activated carbon. 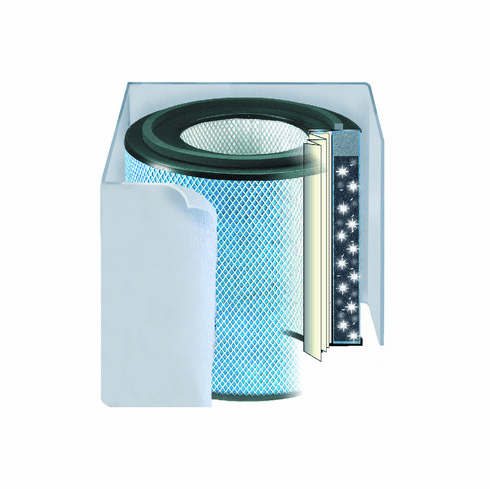 This filter fits all standard size Austin Air purifiers.